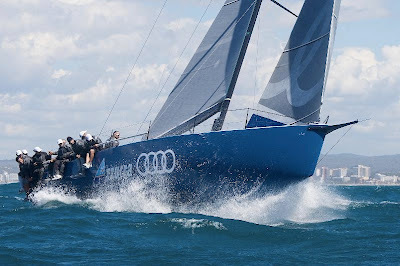 The Audi Azzurra Sailing Team made its competitive debut this morning with its brand new TP52 yacht, on the opening day of the Mapfre Palma Vela. The fresh breeze over 20 knots and the big swell put a strain on the new boat designed by Botín. Tough conditions are certainly not ideal for a recently-launched yacht but this forms part of the game in sailing and racing. The stress test on the new Azzurra did not put into evidence any significant problems but caused merely some minor damages to the numerous pieces of sophisticated hardware that make up a top-level racing yacht such as the latest generation TP52's. The Audi Azzurra Sailing Team is taking part in PalmaVela precisely because the TP52 Class chose this as a training and tune up event in view of the 52 Sailing Series that kicks off in May in Barcelona. The main aim is to learn and develop the boat and not so much the results in each race. "It was a useful day - confirmed strategist Vasco Vascotto - we came here exactly for that reason. Today we had a number of failures, something that is absolutely normal for a boat that has been just launched, and we are happy to be able to remedy now and not run the risk to do it later on, during the proper circuit. Having said that, we still need to get the feeling of the new boat, we made more than one error today and one never stops improving." The day's two races were won, respectively, by Ran and Quantum, while Azzurra TP52 by Audi finished the day in third place, in a fleet unfortunately small in numbers, with four yachts competing, but with a technical and competitive level clearly surpassing the top-notch standards set in the previous season.